The heady days of cheap power prices in Iceland may be nearing an end. With 4,600 GWh annual consumption the Fjarðaál aluminum smelter of Alcoa in Iceland is the largest electricity consumer in the country. The smelter has been enjoying one of the lowest power tariff to aluminum smelters worldwide. However, there are indications that the Icelandic national power company Landsvirkjun and Alcoa will renegotiate the power price no later than 2028. The result is likely to be a significantly higher tariff and a major increase in Landsvirkjun’s revenues and profits after 2028. For Landsvirkjun the power contract with Alcoa is of major importance. This one contract covers about 1/3 of all the electricity Landsvirkjun generates and about 1/4 of all the power generation in Iceland. This one contract has a fundamental impact on the profitability of Landsvirkjun and thus a major impact on average returns in the Icelandic electricity industry. Construction of the Kárahnjúkar dam. The power contract of Alcoa and Landsvirkjun was signed in early 2003, the contract period being 40 years from the first delivery of power. To supply the power, Landsvirkjun constructed the largest hydropower station in Europe (Russia and other former republics of the USSR excluded). The Alcoa smelter in Iceland began operating in mid-2007, reaching full capacity some months later. The power contract covers the period until 2048. It is known that the power contract includes provisions offering the option of revising the power tariff as early as 2028. 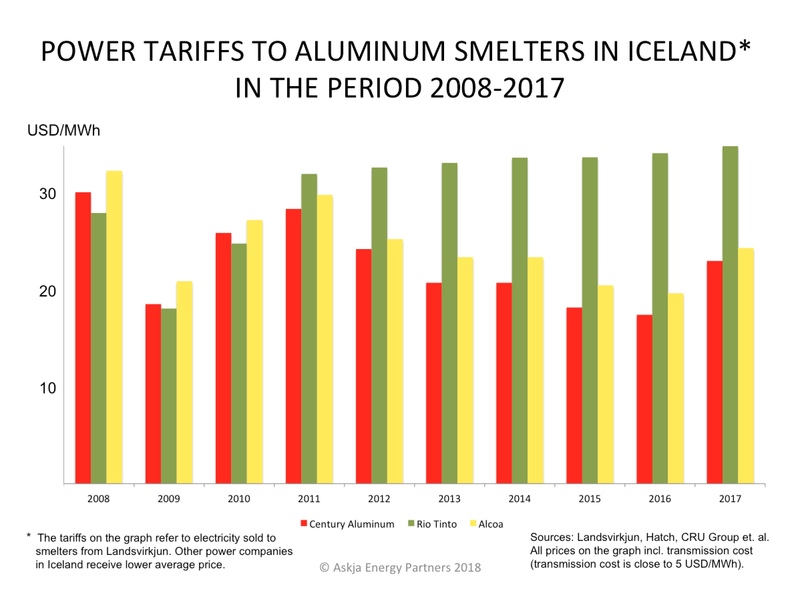 When having regard to recent development of power prices to aluminum smelters in Iceland, there is a reason to expect that the power tariff to Alcoa in Iceland will increase dramatically already in 2028. The power contract between Alcoa and Landsvirkjun is confidential, but documents from the Icelandic Parliament (Alþingi) have shown that 18 years after Landsvirkjun started the energy supply to the Alcoa smelter, the contracting parties shall negotiate a revised energy tariff. The new tariff shall be decided according to market development and shall be in force the second 20 years of the power contract (2028-2048). 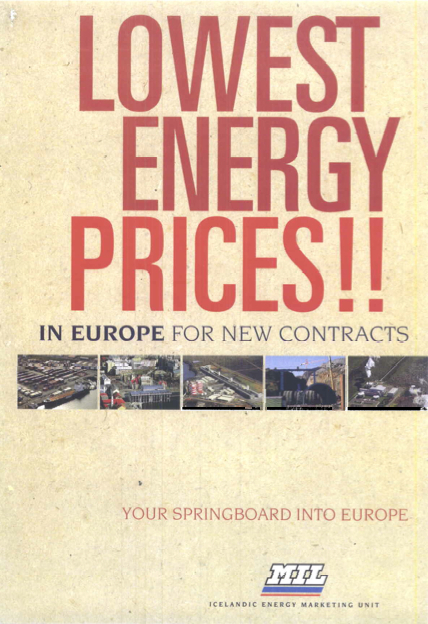 Only Landsvirkjun and Alcoa know how much scope the contract offers in changing (raising) the electricity price. What seems to be the ruling factor regarding this, is how the electricity market will evolve during the period from 2003. 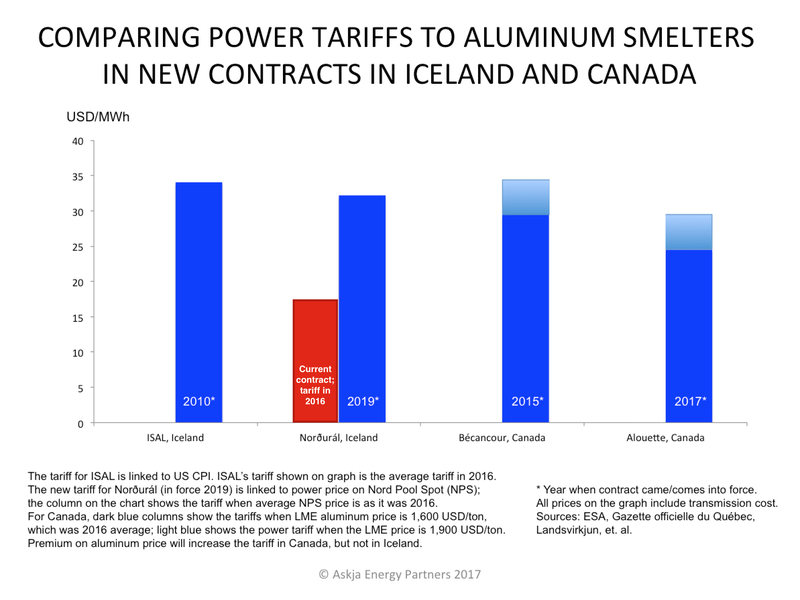 Having in mind the recent development of power tariffs to aluminum smelters in Iceland, it seems possible that no later than 2028 the price of electricity to Fjarðaál may more than double from the current tariff. Such a price increase would have enormous positive impact on the overall profitability of Landsvirkjun. This scenario is, however, subject to various conditions and such a sharp price increase may not go through if aluminum prices will be very low. Few years ago new competition arrangement was introduced in the Icelandic power market. The new legislation meant a major structural change, making the power market focused on financial sustainability (profits) rather than politics, i.e. now each power contract with heavy industries like aluminum smelters must fulfil minimum conditions of financial return. Otherwise the contract may be invalid due to illegal state support. Possible development of Icelandic power tariffs. Because of these structural changes, power tariffs in new contracts in Iceland have been rising substantially. Older contracts like the one between Landsvirkjun and Alcoa, ensure the smelter almost risk-free tariff while the power company bears most of the risk. To give a clear example, we can refer to the current power price Alcoa is paying to Landsvirkjun and compare that price to more recent contracts Landsvirkjun has negotiated with two other aluminum smelters; those of Rio Tinto Alcan (Straumsvík smelter) and Century Aluminum (Norðurál smelter). During 2016, the average power tariff to the Alcoa smelter was close to 20 USD/MWh (the tariff is linked to the price of aluminum at the LME). At the same time the Straumsvík smelter of RTA was paying Landsvirkjun close to 34 USD/MWh, according to a new contract from 2010 where the tariff is fixed and linked to US consumer price index; CPI. The smelter of Century Aluminum in Iceland (Norðurál) pays Landsvirkjun according to an old contract from 1999, where the tariff is extremely low. During 2016, Century and Landsvirkjun renegotiated the pricing method. From 2019, the power tariff to Century will be closely aligned with the power price at the Nordic power market (Elspot at Nord Pool Spot; NPS) . 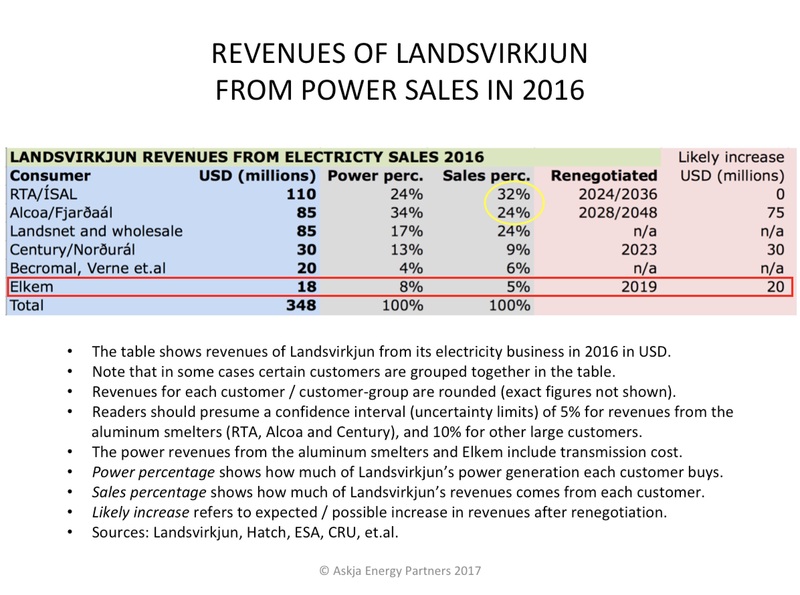 Of course nobody knows for sure what the power price will be at the NPS in 2019, but Landsvirkjun is obviously aiming for moving the Icelandic power market towards the power markets in Northwestern Europe. Which would result in very interesting changes for electricity generating companies in Iceland. We at the Icelandic and Northern Energy Portal, will soon be writing more about the opportunities these changes will create for Icelandic power companies. Stay tuned. 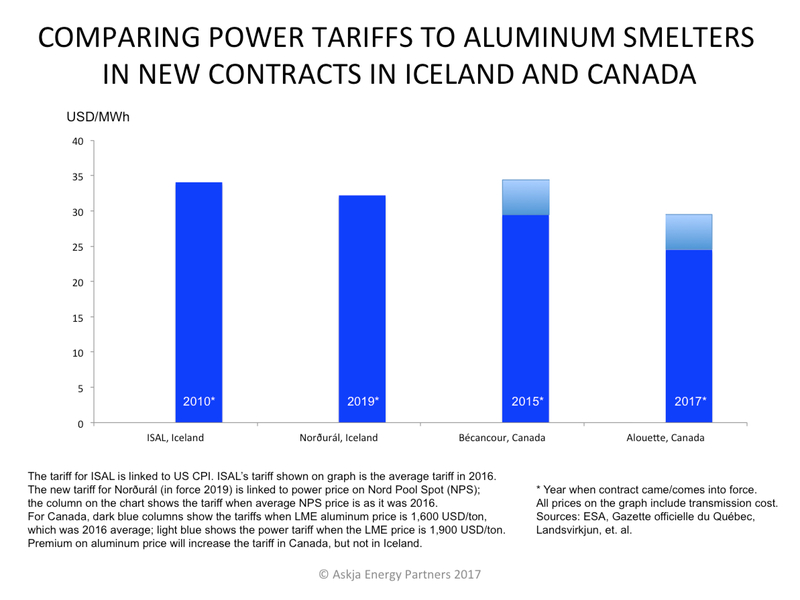 NB: The power tariffs to aluminum smelters quoted in this article are based on research by Askja Energy Partners Ltd. The figures given in the article are not exact and they are based on several assumptions we do not guarantee to be correct. However, we are of the opinion that the mentioned tariffs are very close to the real negotiated tariffs. The universities IIT Comillas in Madrid and MIT in Boston have completed a research project on the mechanisms of the Icelandic electricity sector. The project was managed by Mr. Ignacio J. Perez-Arriaga, pro­fess­or at MIT. The project was twofold. Firstly, the current electricity market regime was examined and suggestions made for improvement. Secondly, a simulation of future operation of the power system was conducted, in which a number of scenarios were evaluated in terms of cost and energy security. There is a lack of clear legislation on acceptable norms in terms of energy security. Also, the legislation needs to be clearer on which agency/department is responsible for how to achieve such criteria for energy security, and what tools the responsible party should have to ensure the criteria can be achieved. Public energy security is not sufficiently guaranteed by the existing power trading system. In their report, the researchers propose how to improve this situation. Further delays in strengthening the Icelandic transmission system will make energy security in Iceland unsafe. Thera are bottlenecks in the system between regions. Those bottlenecks may contribute to a local energy shortage. The south-west corner of Iceland is at the greatest risk for such shortages. There are different ways to strengthen the transmission and each of them has its advantages and disadvantages. Wind power is likely to be a competitive alternative to hydropower and geothermal energy, in order to ensure sufficient supply. Opportunities may also be found in negotiating increased flexibility in delivering power to energy intensive industries. A submarine power cable between Iceland and Europe would better ensure the energy security in Iceland. To make such a project economical, financial assistance would be needed from outside Iceland [for example in the form of similar framework as the British Contracts for Difference; CfD]. This project by IIT Comillas /MIT was funded by the Icelandic National Energy Authority (NEA), the Icelandic TSO Landsnet, and the national power company Landsvirkjun. Presentations from the project can be found on the website of the NEA. Prof. Pérez-Arriaga , who was head of this research project on energy security in Iceland, has been a consultant for governmental agencies or electric utilities in more than 30 countries. Prof. Pérez-Arriaga is a member of the Spanish National Academy of Engineering and a Life Fellow of the IEEE. He has published more than 200 papers, been principal investigator in more than 75 research projects and supervised more than 30 doctoral theses on the aforementioned topics. He is a permanent visiting professor at MIT (2008-present) in the Center for Energy and Environmental Policy Research (CEEPR), where he teaches a graduate course on power system regulation, engineering and economics. He was a review editor of the 5th Assessment Report of the Intergovernmental Panel on Climate Change (IPCC). It should be noted that in October 2015, Mr. Pérez-Arriaga gave a lecture on “the challenge of Energy Security Supply in Iceland”, at the Reykjavík University Arctic Workshop. In his presentation Mr. Pérez-Arriaga referred numerous times to graphs and data from the Icelandic and Northern Energy Portal / Askja Energy Partners, which of course is the main source on Icelandic energy issues. Video recording of the lecture can be seen on Livestream (the presentation starts at 19m:30s, right after an introduction by the President of Iceland). Electricity demand in Iceland is growing and most of the low-cost options in the geothermal- and hydropower sectors have already been harnessed. Thus, it is not surprising that wholesale electricity prices on the Icelandic power market have been rising. What is no less important for the Icelandic power sector, are the rising tariffs in special contracts with heavy industries in Iceland. Heavy industries, like aluminum smelting, ferrosilicon production etc., consume close to 80% of all electricity generated in Iceland. The older power contracts with heavy industries offer the industrial companies the electricity at very low price. The chart at left shows the industrial tariffs in Iceland in 2016 (average tariff through the year). Note that the tariffs shown include transmission cost. The most recent contract is of course the one with the RTA smelter, while the oldest contracts with Elkem and Century Aluminum where negotiated two decades ago. It is likely that the average general industrial tariff in Iceland will rise in the coming years. Icelandic power firms are already in the process of increasing price of electricity to industries in Iceland. The contract between the national power company Landsvirkjun and the RTA smelter at Straumsvík in 2010 was the first real step in this development. In 2010, the tariff to RTA increased substantially and is no longer linked to price development of aluminum. Instead it aligns with the US Consumer Price Index (CPI). 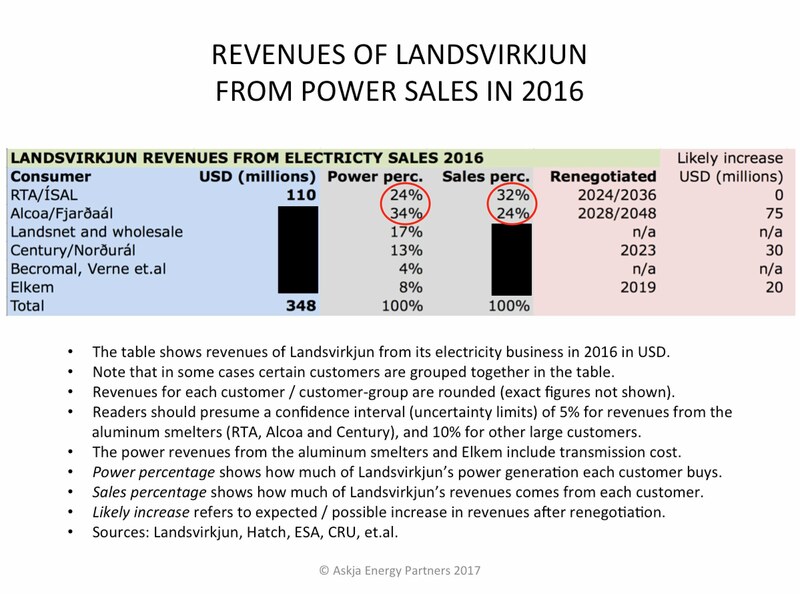 Another important step in increasing revenues from electricity sales to heavy industries in Iceland was taken in 2016, with a new power contract of Landsvirkjun and the Norðurál smelter of Century Aluminum. This new contract will become effective in 2019. From then, the tariff to Norðurál will become aligned with spot price on the Nordic power market (Elspot on Nord Pool Spot). Landsvirkjun is also re-negotiating the power tariff with the ferrosilicon plant of Elkem, which has been paying very low price for the electricity. The expected power price Century and Elkem will be paying according to the new contracts are shown by the arrows on the graph below. However, note that negotiations between Landsvirkjun and Elkem are still ongoing and it is of course possible no agreement will be reached (and then Landsvirkjun would probably be selling the power to other interested companies). More steps towards rising average power price in Iceland will be taken after 2020, when several old contracts with heavy industries will run out. This applies to a couple of contracts Reykjavík Energy and HS Orka have with the Norðurál smelter (owned by Century Aluminum). 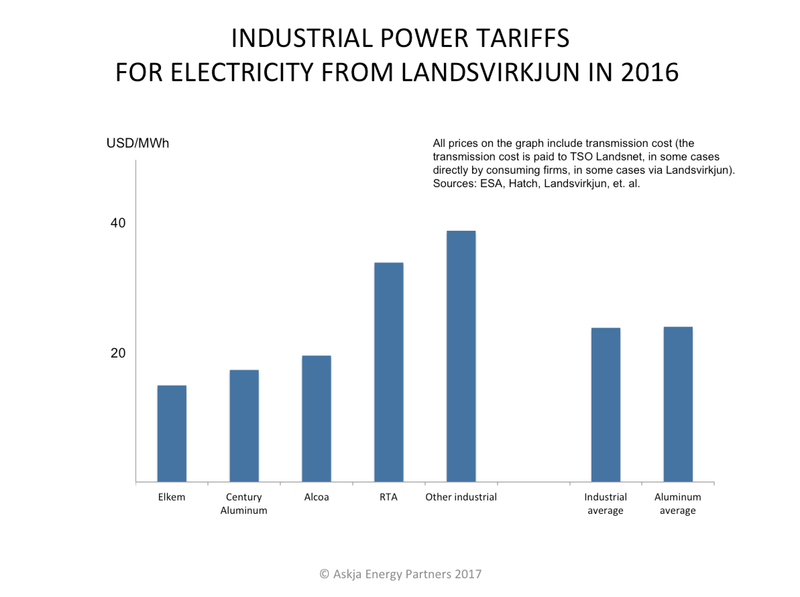 This development towards higher power tariffs will probably also affect a very large power contract Landsvirkjun has with the Alcoa aluminum smelter of Fjarðaál, where the tariff is to be re-negotiated no later than 2028 (as can be seen highlighted on the graph at left). Due to the new contract with RTA in 2010 and some other recent contracts with other smaller power intensive firms in Iceland, the average power tariff in new contracts with heavy industries in Iceland is already rising. 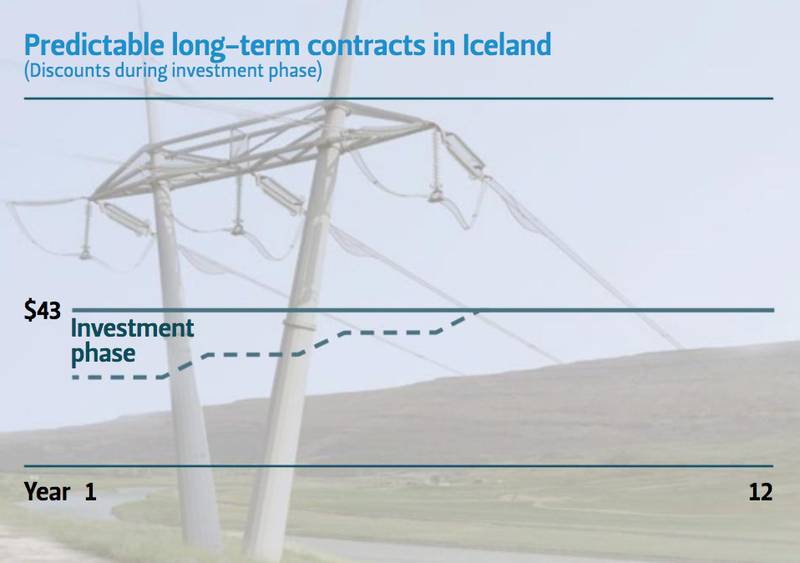 This development can be expected to continue, resulting in a general power price to heavy industries in Iceland moving towards approximately 30-35 USD/MWh when transmission cost not included; close to 35-40 USD with the transmission cost. This is shown by the lower green limit on the graph above. Other large customers, i.e. less power-intensive industries and services such as large data centers, will also be experiencing rising tariffs; probably around 40 USD/MWh when transmission cost is not included and close to 45 USD/MWh with transmission cost, as shown by the higher green limit on the graph above. The development so far is already a clear sign of rising power prices in Iceland. 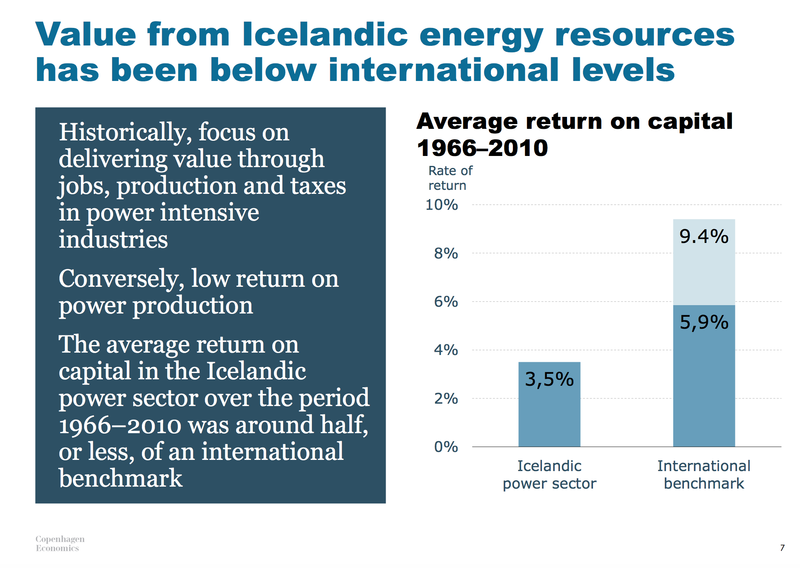 The rising tariffs reflect the necessity to increase return on capital invested in Icelandic power production, which so far has in general been very low, as explained in a recent report by Copenhagen Economics (the slide at left is from a presentation by Copenhagen Economics). Also, rising levelized cost of energy (LCOE) for new power plants in Iceland will push the electricity tariffs up. So rising power prices in Iceland can in fact be explained with simple economics. The Norðurál smelter of Century Aluminum, at Grundartangi in Southwest Iceland, enjoys the lowest electricity tariff to aluminum smelters in Iceland. The only company in Iceland paying lower electricity tariff, is the ferrosilicon plant of Elkem, also located at Grundartangi. All the three largest power companies in Iceland supply the Grundartangi aluminum smelter with electricity. The pricing arrangements in all the contracts are quite similar. All the contracts have the power tariff aligned to the price of aluminum on the London Metal Exchange (LME). In 2016, all the three power companies selling electricity to the Norðurál smelter where receiving an average price close to 20 USD/MWh (as shown on the graph at left). Note that transmission cost is included in the price shown on this graph. For comparison, the graph also shows the power price from Landsvirkjun (LV) to the ÍSAL smelter of Rio Tinto Alcan (RTA) at Straumsvík in Southwestern Iceland. 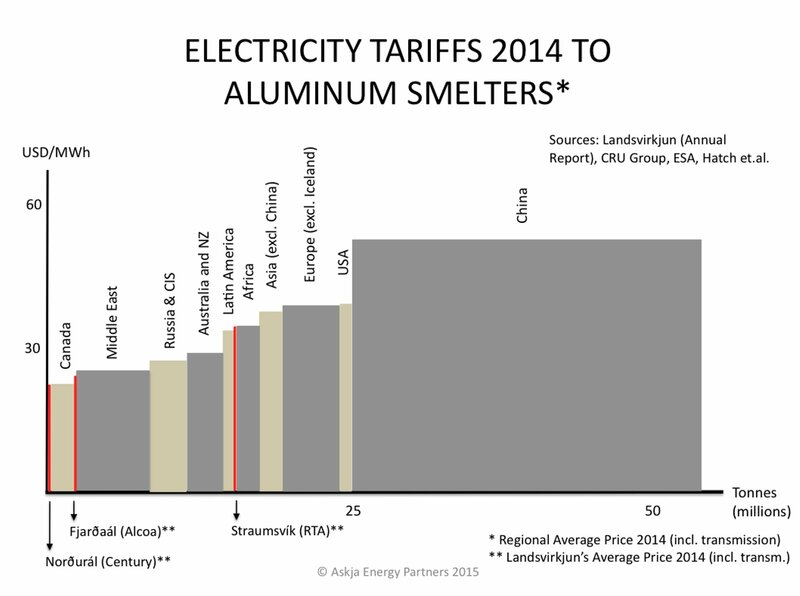 Of all the three aluminum smelters in Iceland, the Straumsvík smelter pays the highest electricity tariff. Which is not surprising, as the Straumsvík smelter has the most recent power contract. More information about recent power contracts with aluminum smelters can be seen here. Most of the power consumed by the Norðurál smelter is generated by Reykjavík Energy, utilizing geothermal sources (unfortunately Reykjavík Energy has been faced with major difficulties in sustaining its geothermal power production). Reykjavík Energy is called Orka náttúrunnar (ON) in Icelandic. It is a subsidiary of Orkuveita Reykjavíkur (OR), which is mostly owned by the city of Reykjavík. The second largest power supplier to the Norðurál smelter is the national power company Landsvirkjun. Landsvirkjun generates most of its electricity in hydropower stations. In 2016, the company concluded a new agreement with Norðurál/Century, which will change the pricing method (the new agreement goes into force in 2019). The third company selling power to the Norðurál smelter is the privately owned HS Orka, where Canadian Alterra Power is the major shareholder. Like Reykjavík Energy, HS Orka mostly relies on geothermal sources for its power generation. As mentioned above, the cost of transmission is included in the power prices on the graph above. Each of the three power companies has to pay the transmission cost forward to the Icelandic Transmission System Operator (TSO), which is Landsnet. The graph at left should make it more clear what amount (price) the power companies are receiving for each megawatt-hour (MWh) of electricity sold. On this graph, we highlight the part of the tariff that is the transmission cost (the grey part of the columns). Finally, note that readers should presume a confidence interval (uncertainty limits) of 5% regarding the Landsvirkjun-tariffs presented, and a 10% confidence interval regarding tariffs from Reykjavík Energy and HS Orka. The average price of aluminum in 2016 was lower than the previous year (2015), resulting in lower average revenues per sold MWh for the Icelandic power firms selling electricity to the aluminum industry. 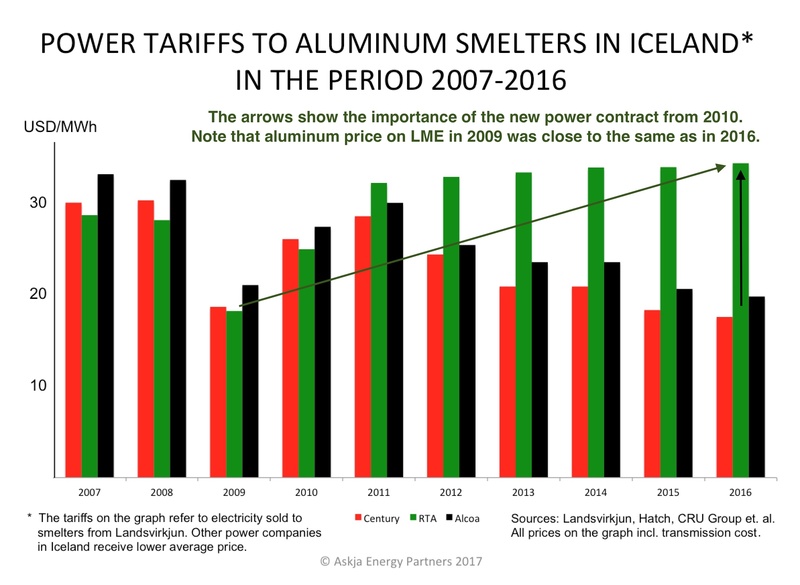 In this article we present updated information on the power tariffs paid by each of the three aluminum smelters located in Iceland. Note that readers should presume a confidence interval (uncertainty limits) of 5% regarding all the tariffs presented. 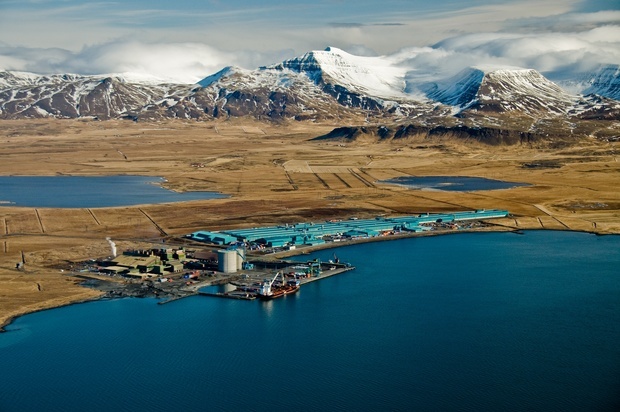 One of the three smelters, the ISAL / Rio Tinto Alcan (RTA) in Straumsvík, pays a fixed base-tariff which is linked to the US Consumer Price Index (CPI). The RTA smelter in Straumsvík (green column on the graph below) receives all its electricity from the national power company Landsvirkjun. The power contract of RTA and Landsvirkjun is from 2010, with additions in 2014. Before the new agreement in 2010, the RTA-smelter at Sraumsvík was paying very low tariff, which was linked to the price of aluminum. The power contract from 2010 was extremely important for Landsvirkjun, having very positive effects on its revenues and return. This contract reflects a start of Landsvirkjun’s new pricing policy, moving away from the risky price-connection with aluminum. The other two smelters in Iceland – the Norðurál smelter of Century Aluminum at Grundartangi (red on the graph) and the Fjarðaál smelter of Alcoa at Reyðarfjörður (black on the graph) – have power contracts based on the old pricing-model. Both of these two smelters have contracts with Landsvirkjun, where the power tariffs are linked to the price of aluminum at the London Metal Exchange (LME). 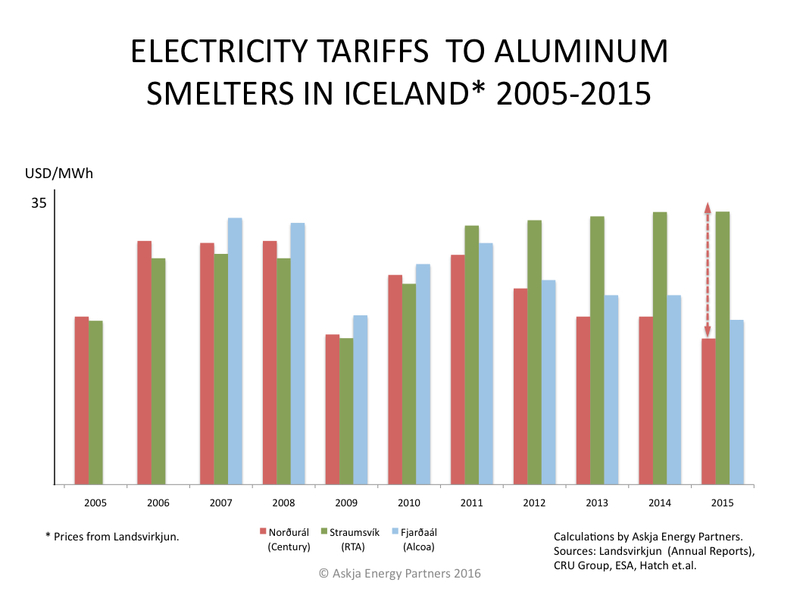 Thus, the power tariffs of Norðurál (Century) and Fjarðaál (Alcoa) fluctuate with the price of aluminum, As the price of aluminum has been low during the last few years, the power tariffs of Norðurál and Fjarðaál have also been on the downside, as can clearly be seen on the graph at left. Landsvirkjun’s power contract with Fjarðaál (Alcoa) is the original contract signed in 2003. The current contract Landsvirkjun has with Norðurál (Century) is a re-negotiated contract from 1999 (original contract was from 1997). As we explained in a recent article, Landsvirkjun and Norðurál have reached an agreement on new power tariff for the period 2019-2023. The new tariff will be aligned to the Elspot tariff on the Nordic power market (Nord Pool Spot; NPS), replacing the current price-link with aluminium price. This new contract with Norðurál was concluded in 2016 and becomes effective in 2019. The contract is likely to be an important step in bringing the Icelandic power market more in line with the power market in the other Nordic countries. The next step in this development is likely to be a new contract Landsvirkjun is currently negotiating with the Chinese owned Elkem, which owns and operates a ferro-silicon plant in Southwestern Iceland. The current power contract with Elkem, where the tariff is based on price development of ferro-silicon and the exchange rate of the Norwegian krona (NOK), runs out in 2019. In recent years, the power price for the Elkem-plant in Iceland has been extremely low (lower than the power price paid by the Norðurál smelter). Probably Landsvirkjun wants a major change in the pricing methodology, developing the tariff to Elkem towards the Nordic market spot pricing model. Finally, note that the graph above only includes power contracts the aluminum smelters have with Landsvirkjun. Two other Icelandic power firms also generate and sell electricity to the aluminum industry in Iceland. These two firms are HS Orka and Orka náttúrunnar (Orka náttúrunnar is normally referred to as ON or Reykjavík Energy). ON is in public ownership, while HS Orka is privately owned. Both companies – ON and HS Orka – mostly rely on harnessing geothermal energy for their power generation. And both have long-term power contracts with the Norðurál smelter, where the tariff is linked to aluminum price on LME. The average power tariff in these contracts is slightly higher than the tariff in Norðurál’s contract with Landsvirkjun from 1997/1999 (the red column on the graph above). The Icelandic Energy Portal will soon be introducing more information about the power tariffs in the contracts Norðurál has with ON and HS Orka. As we explained in a recent article, the Icelandic national power company Landsvirkjun has signed a new contract with the Century Aluminum smelter in Iceland (Norðurál). In this article we will compare the power tariff in this new contract with three other recent power agreements with smelters in Iceland and Canada. In our comparison we analysed information about four recent power contracts. 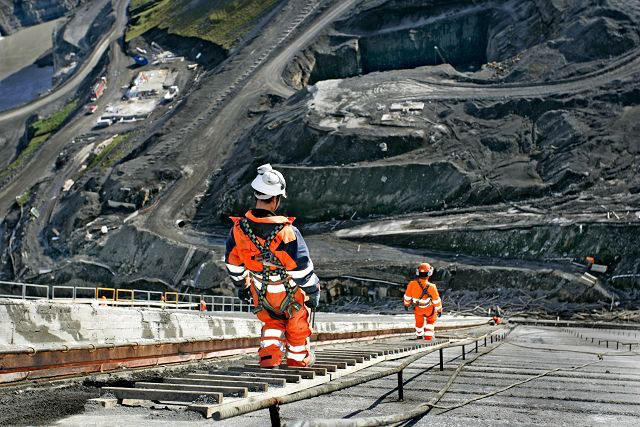 They are, in addition to the new Norðurál-contract, a contract between Landsvirkjun and ISAL/RTA regarding the smelter at Straumsvík in Southwestern Iceland, a contract between Hydro Québec and Alcoa/RTA regarding the Bécancour smelter in Québec in Canada, and finally a contract between Hydro Québec and Aluminerie Alouette regarding the Sept-Iles smelter, also in Québec. These four contracts were concluded in the period 2010-2016 and they came / will come into force in the period 2010-2019 (as shown on the graph below). Each of the four contracts are different from the others. Both of the Canadian contracts are long-term and the price of the electricity in both of them is linked to the price-development of aluminum at the London Metal Exchange (LME). 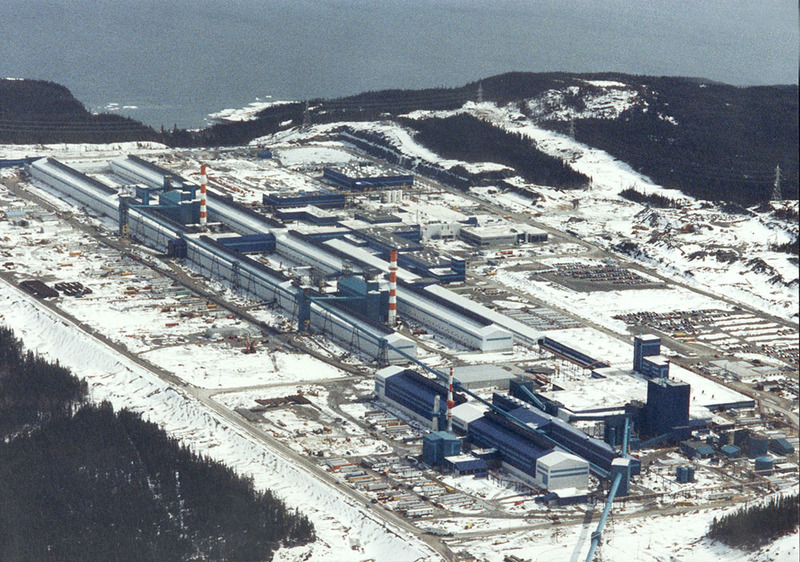 However, these two Canadian contracts are based on different prerequisites, as one of them (the Aluminerie Alouette contract) involves an obligation for conducting an engineering study for a potential later expansion of the smelter. The two Icelandic contracts do not include any price-link with aluminum. The contract with ISAL/RTA from 2010 has a fixed starting tariff, linked to US consumer price index (CPI). The tariff in the more recent contract with Century’s Norðurál is linked to power price at the Nordic power market (Elspot on Nord Pool Spot; NPS). The contract with ISAL, which was concluded and came into force in 2010, is a long-term contract of 25 years. The contract with Norðurál, agreed in 2016, will come into force in 2019 and only has a duration of four years. 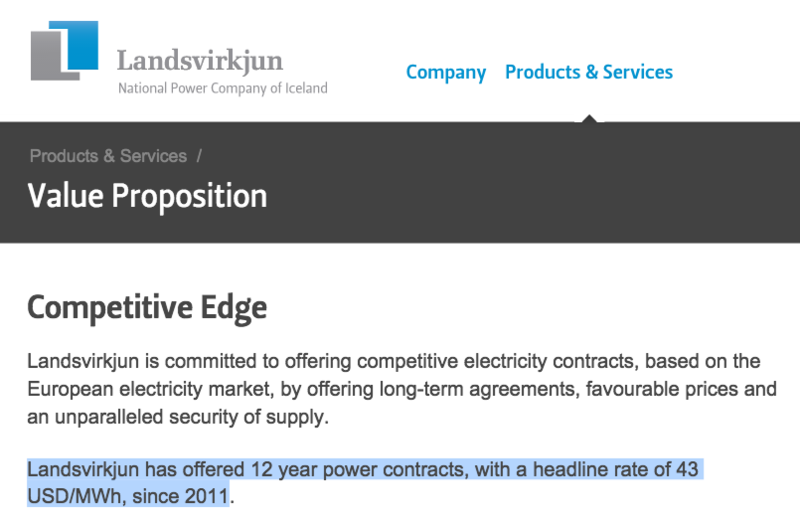 The contracting parties, Landsvirkjun and Norðurál, have offered no explanation about why the time-period of the new contract is so short, but an obvious reason is the new tariff being strongly aligned with spot market price of electricity on NPS (as explained in our last post). The graph at left shows a.o. the approximate average tariff to the Straumsvík smelter of ISAL/RTA in 2016 (the tariff can be expected to rise steadily, as it is linked to the US CPI). The power price paid by Bécancour and Alouette depend on the development of aluminum price, and the blue columns reflect the average base-tariff for these two Canadian smelters in 2016 (when average aluminum price was close to 1,600 USD/ton). The light-blue part of the tariff shows how the Canadian tariff will rise if/when aluminum price becomes 1,900 USD/ton, as recently happened. We should add that when there is a premium paid for aluminum, as has been the norm most of the time in recent years, the Canadian tariffs will increase, according to a certain formula in the two contracts. Note that the Canadian tariffs shown on the graph are as when the premium is zero. If/when there will be a premium, the power tariffs to the said Canadian smelters will be somewhat higher. With regard to the above mentioned statements by ESA, we can assume that the new tariff to the Norðurál smelter will be similar or even the same as the tariff paid by industries in the Nordic market. Furthermore, the statements by ESA strongly imply that the new base-tariff to Norðurál is actually the same as the spot price for electricity on NPS (or at least very close to the spot price). Thus, the new tariff to Norðurál shown on the graph above is the same as the average spot price on NPS in 2016 (Elspot) – with certain part of the transmission cost added (the part of the transmission cost which is not included in the Elspot-price). 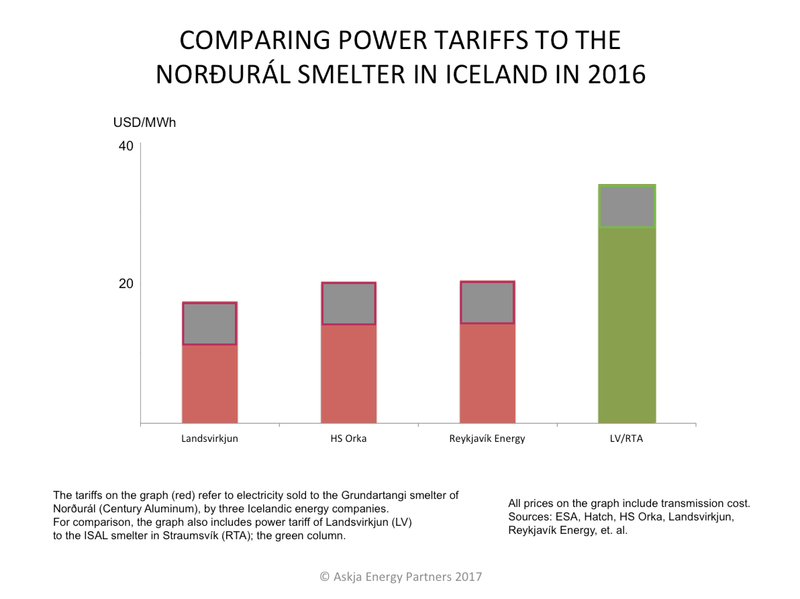 Of course it is possible that the new base-tariff for Norðurál from 2019 may be somewhat lower than the full Elspot-price, as power companies on the Nordic power market may sometimes offer its largest customers a discount from the spot-price on NPS. However, when having regard to the statements of ESA, and with regard to Landsvirkjun’s tariffs to ISAL/RTA, it seems unlikely that the new contract will be offering Norðurál large discount from the Elspot-price. 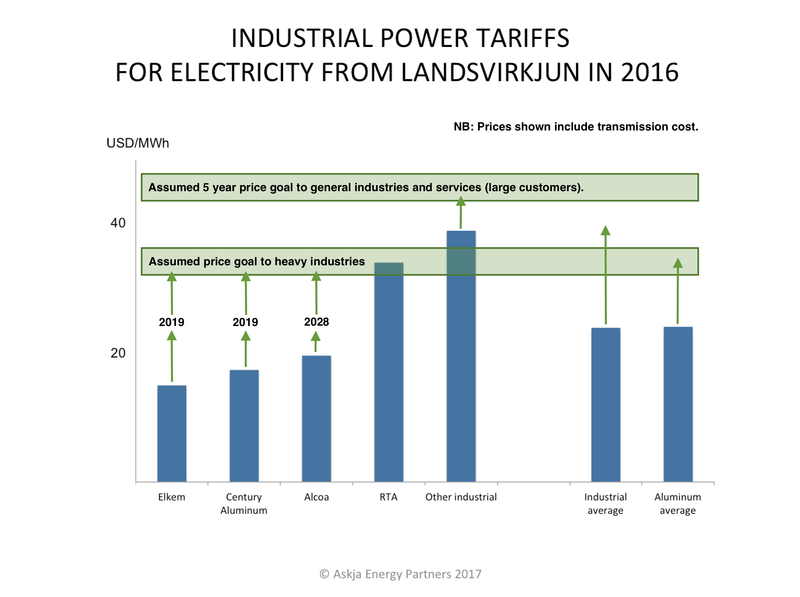 Finally, note that the assumed new tariff to Norðurál shown on the graph(s) includes the transmission cost that the aluminum firm has to pay to the Icelandic TSO; Landsnet. And note also that Norðurál will continue to pay its current very low tariff to Landsvirkjun until 2019 (when the new power contract enters into force). The power tariff Norðurál is currently paying Landsvirkjun happens to be one of the lowest electricity price enjoyed by any of the world’s two hundred-plus aluminum smelters (Norðurál also buys substantial amount of electricity from two other Icelandic power firms, where the average price is only slightly higher than the tariff it pays to Landsvirkjun). Last year (2016), the average price Norðurál paid for the electricity from Landsvirkjun was well below 20 USD/MWh (transmission cost included), as shown on the graph at left (the red column). So it is obvious that the new contract, coming into force in 2019, will increase Landsvirkjun’s revenues substantially – unless we will experience extremely low prices for electricity on the Nordic Elspot power market during 2019-2023.